The Home Screen has 4 buttons that will help you navigate the app. PLAY NOW will drop you into a random game where you have enough Play Chips to enter. FIND YOUR CLUB button will help you find your friend’s Poker Club. Press the button and enter your friend’s nickname in the search bar. This will allow you to request entry to their Private Games. In the upper-left corner, there is a drop down menu to help you navigate the app. All of these button are also accessible here. The Poker Lotto Game is 2 games in 1. Make a poker hand or match your cards to the cards randomly drawn. The game is similar to Poker Lotto games played across different states in the USA. The drawings are completely random. In Poker Clubs, The Poker Lotto Game costs 1 gold per line and is paid by the host of the Poker Club. In the Public Lobby, the game costs the price stated and you can win different currencies. You can designate any player in your club to be a sub-host. The sub-host can only distribute chips from their own bankroll. This means they have to get chips from the host to distribute to other players. The sub-host can create games, process cash out requests, allow players into the club, and ban players. You can join forces with other Club owners with the Agent feature. Assign your players to one agent and assign your partners players to another agent. This will allow you to keep track of the rake for 1 player or a group of players. The rake stats are calculated based on the contribution method. If you put 50 chips into a pot of 150, and the rake collected is 3 chips, you would be assigned a player rake of 1 chip. The RNG is based on Java’s SecureRandom class. No rake if pot is less than 5x the Big Blind. No Bad Beat Jackpot deduction if the pot is less than 5x the Big Blind. Long Press on any ring game to see rake info. Starting from the top of the drop-down menu in the upper-left corner. 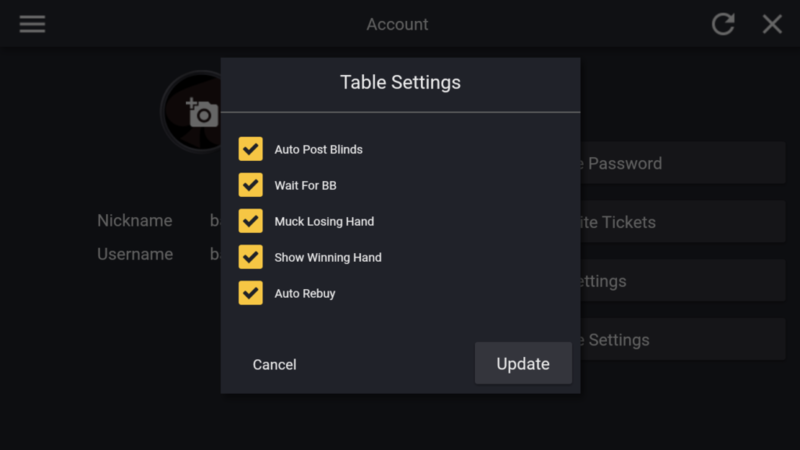 Auto Post Blinds: If checked, player automatically posts blinds when they are due . If unchecked, the player has to confirm posting big blind. Wait For BB: If checked, player will automatically wait and only post big blind when it is their turn to be the big blind. If unchecked, player will not wait for the big blind to start playing. Muck Losing Hand: If checked, the player will automatically throw their cards into the muck without showing. If unchecked, the player may be given the option to show the losing hand. Show Winning Hand: If checked, the player can show their hand at the end without mucking. It is also possible to show only one card when this is checked. The cards highlighted in red will be shown to opponents. Tap each card that you do not want to show so it is no longer highlighted. Auto Rebuy: If checked, the player will automatically rebuy for the same amount as their initial buy-in. Player must have more chips for this to function. Starting from the top of the drop-down menu, in the upper-left corner, tap on PUBLIC LOBBY. This will take you to the public games that anyone can join. MAIN TAB: The 4 in-game currencies are displayed here. Play Chips: red play chips that can be bought with Gold or earned with a daily login bonus. Gold Chips: the gold chips can be won in various tournaments or purchased in the app store. Emeralds: can only be earned by watching ads and from a daily login bonus. Emeralds will never be for sale. Rubies: represent real money. You can only win Rubies by playing in ring games and tournaments with Emeralds. 1 Ruby equals one American Dollar. Please visit our SWEEPSTAKES PAGE for more details on tournaments that give away the Ruby currency. Note: The chips inside the Poker Clubs are assigned by a host and have nothing to do with these 4 currencies. An infinite amount of chips can be assigned inside these Private Games. TABLES TAB: In the tables tab, there is a sort button in the upper right to sort the games by type. All tables listed here are ring games. They require play chips that you can purchase on the main tab. Some games in this tab cost gold her hand. These games are eligible for the Bad Beat Jackpot. Long press the table listing for more info. The Bad Beat Jackpot info can be found in the “More…” Tab. FAST TAB: The games listed here are Fast Poker where you can fold a hand and instantly be dealt a new hand. Some games here also cost gold per hand because they qualify for the Bad Beat Jackpot. Long press the table listing for more info. SNGs TAB: The games listed here are Sit-and-Go tournaments. They start as soon as the required number of people have registered. Long press a listed tourney for more info. MTTs TAB: The games listed here are Tournaments that start at a set time without a player limit. Long press a listed tourney for more info. MORE…TAB: Lists the Bad Beat Jackpot. Tap on the BBJ total for more info. The Bad Beat Jackpot in the Public rooms is different than the Private Rooms. The Public BBJ pays in Gold. The Private BBJ pays in chips assigned by the host. THE LEADERBOARD: lists the top 100 players. The ranking is by Play Chip profit. Play Chips can be won by playing in ring games or tournaments. HAND HISTORY: The Hand History found here is for the Public Lobby only. Starting from the top of the drop-down menu in the upper-left corner, tap on Private Rooms. The First page will take you to a list of Private Rooms where you are active as a host or player. All players start with zero chips. Only the host can give or take a player’s chips. The Private Rooms are fueled by gold. All tournaments costs gold to enter plus any chips the host requires. All Ring games cost gold per hand if they are eligible for the Bad Beat Jackpot or not. Bad Beat Jackpots inside of a Private Room are only for players that are members of the Private Room. The BBJs are fueled by the chips assigned by the host. The chips inside of a Private Room are separate from the Play Chips available in the Public Lobby. From here you can create your own Private Room where you can control who can enter and who gets chips and how many. You can create Custom Ring games and Tournaments. You can create a Bad Beat Jackpot for your Ring Games. Step 1: Enter Room Name. There are 2 types of Private Rooms. Either the Host can rake or the Host cannot rake the games. Private Rooms without the rake feature are the cheapest option. Private Rooms with the rake feature have a detailed rake breakdown for each game type. This is found in the Host Tab. Choosing different Private Room time lengths and rake on/off will change the gold prices in the window below (in app). Private Room Length: The length of time you can control the room. This time can be extended for the same price it costs to start the room once it is open. Go to the Host Tab in the Private Room. Join Private Room: This is the cost for another player to join your room. Cash Game Hand: This is how much gold per hand it costs each player participating in a ring game. Join Tourney: This is how much it costs each player to join a tourney. Cost To Create Private Room: This is the cost that the Host pays to create the room. This is a feature where the host can make the players that join their room pay more gold per game and the extra gold goes into the Host’s account. Example: You want to create a room for your friends without a rake, but you want to create a reward for yourself for organizing the games. If you enter 50% in the Host Tax field, this means that all ring games will cost 50% more gold per hand. Also, all Tournaments will cost 50% more gold to enter. This extra gold goes directly into the Host’s account. This feature does not effect the rake and can also be used with raked ring games. Gold fuels the Private Rooms and “The Host Tax” makes the cost of the Rooms more expensive to the benefit of the Host. Set to Zero to not use this feature. Step 4: After you have picked the appropriate options, tap the “Create” button. Invites: This system is only used if a host does not have their games publicly listed in the “Find Home Game” search function. You will find invites to Private Rooms here. There is also a button for your invite code. Tap the “My Invite Code” button to give your invite code to a host. Copy and paste the code into your designated messaging app and send to a host. You cannot be invited to a Private Room without providing your invite code. 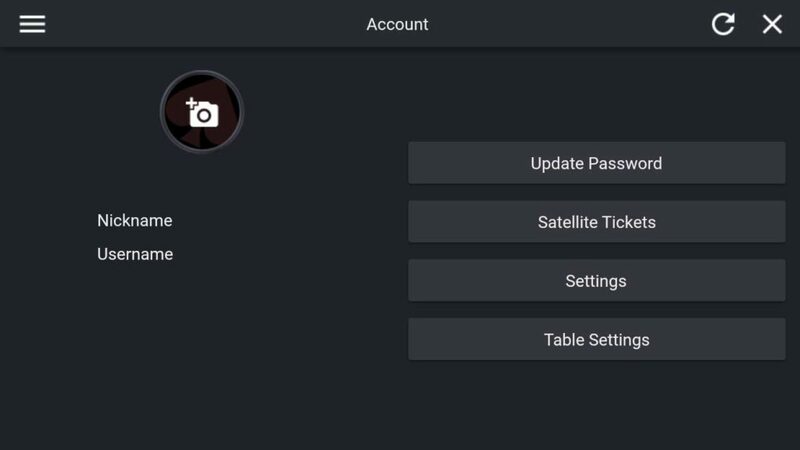 When Hosting, after a player has joined your room, they will show up in your recent invite list to invite them to another room without using the invite code. View Finished: Here, you will find statistics from past Private Rooms in which you were a participant as either a Player or Host. Only rooms that have expired appear here. If you run out of time while playing in a game, do not worry, your chips will still be accounted for in this section. Refresh Button: To the left of the X Button. Checks for changes to the Private Room made by the host. BBJ: Displays the Bad Beat Jackpot, if there is one. CHIPS: Displays how many chips are available to the player for use in the Private Room. ROOM TIME: Displays the amount of time remaining in the Private Room. Request Cashout: Player can request to redeem chips from host with this feature. Cashout History: Player can see how many times he has redeemed chips from host. Satellite Tickets: For Satellite Tourneys. Displays the ring games for a Private Room. Long Press a Table to get more info. BBJ eligibility will be displayed here along with any rake info. Ring Games listed here cost gold per hand. The price is listed on the far right. This is where a host can add a custom ring game to their Private Room. Step 2: Choose game type from drop down menu. No limit Holdem will be the default choice unless changed. Step 4: Choose your blinds and ante. Step 5: Choose the minimum and maximum buy-in amount. 50 BBs = 50 big blinds. Step 6: Choose a rake. Only available in rooms where the host is permitted to rake. Choose 0-10%. A 5% rake with a 5 Rake Cap means that 5% of the pot can be raked with a maximum of 5 chips taken out of the pot. Zero means there is no maximum Rake Cap. Step 7: (Optional) Choose how many chips per hand go into the Bad Beat Jackpot. A Bad Beat Jackpot must be created for this to go into effect. If the hand is won pre-flop, there is no deduction for the jackpot. Decimals can be used here. Step 8: Choose the amount of time a player has to act per hand. Step 9: Disconnection Protection. If selected, disconnected players will have their hand treated as all-in, versus having their hand folded. Step 10: Show hands on all-in. If this option is chosen, players will be forced to show their cards in a showdown if all remaining players are all-in. Step 11: Hit and Run (minutes). Prevents players from winning on this table, leaving, and buying back in for less than what they’ve won. Set to zero for none. Players must sit out for this designated amount of time before they can return to this table with the minimum buy-in. Step 12: Add ring game. The games created here will show up in the “Tables” tab. Step 1: Choose game type from drop down menu. No limit Holdem will be the default choice unless changed. Step 2: Choose Buy-in amount and Fee amount (optional). The buy-in goes into the Prize Pool. The Fee goes to the host and is considered a rake for the tournament. Fee is only available in Private Rooms that have the rake feature. Step 3: Choose the maximum amount of players allow to join the tournament. The tournament will automatically start when the chosen amount of people is reached. Step 4: Choose the amount of seats in a table. Example: Choosing 2 will create a heads up tournament where there are only 2 seats per table. Step 5: Starting Chips. Choose the amount of chips each player receives to start the tournament. Starting chips and Blind Schedules should be carefully considered. Step 6: Choose the amount of time a player has to act per hand. Step 7: Disconnection Protection. If selected, disconnected players will have their hand treated as all-in, versus having their hand folded. Step 8: Show hands on all-in. If this option is chosen, players will be forced to show their cards in a showdown if all remaining players are all-in. Step 9: Name and Description. Fill this out to keep track of your tournaments. Step 10: Set the Prize schedule. Tap on the helper tool to choose how the payouts are structured. Enter the number of players to be paid on the next page. Use the slider tool on the next page to fine tune the payout percentages. Tap submit when you are finished. You will now see the updated payout info below the helper tool button. Tap the back button to finish creating your custom SNG. A payout written as 50, 30, 20 means 1st place gets 50% of the prize pool. 2nd place gets 30% and 3rd place gets 20%. Step 11: The Blind Schedule. There are 10 Levels by default with a maximum of 71 levels. Levels should be selected based on the starting chips and the amount of players. It is also possible to select the amount of time for each level. The default is 360 seconds or 6 minutes. Step 12: Add SNG. Your created SNG tournament will appear in the SNG tab. Step 2: Set the tournament start time. Choosing 0 hours and 1 minute means the tournament will start 1 minute after the host creates the tournament. Make sure you choose a start time that allows all players to enter. You must register before the start time to participate in the tournament. Step 3: Choose Buy-in amount and Fee amount (optional). The buy-in goes into the Prize Pool. The Fee goes to the host and is considered a rake for the tournament. Fee is only available in Private Rooms that have the rake feature. Step 4: Choose the minimum amount of players that must register for the tournament before it can start. Setting a maximum is optional. Step 5: Choose the amount of seats in a table. Example: Choosing 2 will create a heads up tournament where there are only 2 seats per table. Step 6: Starting Chips. Choose the amount of chips each player receives to start the tournament. Starting chips and Blind Schedules should be carefully considered. Step 7: Choose the amount of time a player has to act per hand. Step 8: Disconnection Protection. If selected, disconnected players will have their hand treated as all-in, versus having their hand folded. Step 9: Show hands on all-in. If this option is chosen, players will be forced to show their cards in a showdown if all remaining players are all-in. Step 10: (Optional) Set a time bank. Players that run out of time to act during a hand can get extra time to think from the time bank. Players will automatically fold once they have used up the timer per hand and the time bank. Step 11: (Optional) Set the amount of time players take a break. 300 seconds every 55 minutes would be a 5 minute break every 55 minutes. Step 12: Name and Description. Fill this out to keep track of your tournaments. Step 13a: Set the Prize schedule. Guaranteed prize pool (Optional) is for if the host wishes to set up a guaranteed prize regardless if the amount of buy-ins can cover the prize pool. Step 13b: Set the Prize schedule continued… Tap on the helper tool to choose how the payouts are structured. Enter the number of players to be paid on the next page. Then, use the slider tool on the next page to fine tune the payout percentages. Tap submit when you are finished. You will now see the updated payout info below the helper tool button. A payout written as 50, 30, 20 (in app) means 1st place gets 50% of the prize pool. 2nd place gets 30% and 3rd place gets 20%. Tap the “back” button in the upper-left to finish creating your custom MTT. Step 14: The Blind Schedule. There are 10 Levels by default with a maximum of 71 levels. Levels should be selected based on the starting chips and the amount of players. It is also possible to select the amount of time for each level. The default is 360 seconds or 6 minutes. Step 15: Add MTT. Your created MTT tournament will appear in the MTT tab. PAY GOLD FOR PLAYERS: You can turn off or on. 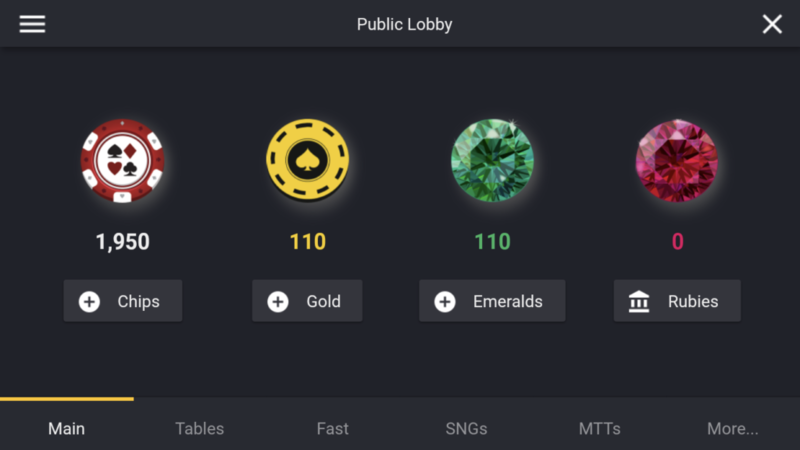 With feature enabled, the host pays for all the gold players use within the room. PAY GOLD FOR PLAYERS LOGS: Keeps track of the gold spent by players in your Private Room. INVITES FROM SEARCH: When players search for your Private Room, the invite requests will appear here. INVITE: Once a player has shared their invite code with you, you can paste it into the text field and invite them. Once they accept the invite, they will be a part of your room. CHIPS: Add and deduct chips from players here. Players can also request a cashout. Hosts can create a custom Bad Beat Jackpot for their Ring Games. The host can choose the minimum hand that qualifies as a bad beat. In order for the Bad Beat Jackpot to be triggered, the winner and loser of the hand must have both hole cards play. It is not considered a bad beat if both hole cards do not play. Step 1: Tap on The Bad Beat Jackpot button in the Host tab. This screen will display active Bad Beat Jackpots. Step 2: Tap the “Add New BBJ” button. Step 4: Enter “Seed” and “Reseed” amounts. The Seed amount is the amount the BBJ will start with for the first time. In most cases, this will be zero unless the host wants to start the pot with something in it. The Reseed amount is the amount a new BBJ will start with once the pot has been won. This will be zero in most cases unless the host wants the pot to start with something in it. Step 5: Enter the minimum qualifying hand. ThTsTd2s3c would be trip tens. See Example. Step 6: Set percentages for Loser, Winner, and Table share. If there are only 2 players, the table share is split between the 2 players. If there are 3 players, the entire table share goes to the 3rd player at the table. If the are 4 or more players, the table share is split among all players not the winner or loser of the hand. Step 7: Select the games that are eligible for the Bad Beat Jackpot. If all game types remain checked, any future ring games that are created that enter an amount in BBJ per hand field will contribute to the BBJ. Any hand won pre-flop will not contribute to BBJ. It is also possible to set up Multiple BBJs for different games. There can only be one BBJ for a particular game type when considering multiple BBJs. For example, one BBJ can be for PL Omaha and another BBJ can be for No Limit Holdem. There cannot be 2 different BBJs for No Limit Holdem. Step 8: Add BBJ. Any Table that is eligible for the BBJ will have the Jackpot total displayed at the table. Also, long press on a ring game (“Tables” tab) to see Jackpot eligibility and other info. This button will extend the time of your room before it closes. Once the room closes, another room must be created to continue playing. Rooms that have run out of time will always be available to view in the “View Finished” area. Check the box if you want your Private Room to be found in the search results. Other players can enter your nickname to find your Home Games. TOURNEYS: You can review stats about tourneys in your Private Room. BBJs: The list of BBJs and winners will be displayed here. HOST: If the host has permission to rake, a running total will be displayed at the top. The “Chips” section shows how many chips were given and how many remain in your Private Room. Player Stats: Shows the profits and losses of players in the room. Cashout Requests: Shows which players have requested a cashout. Host can approve or deny. Players will be listed here in alphabetical order. It is possible to boot a player from a tournament or ring game with this option. It also possible to undo this. Players in a tournament will automatically check/fold for the remainder of the tournament. If a player is unbanned, they can return to the tournament if they still have chips. Ends the room even if there is still time remaining. All players will no longer be able to play inside the Private Room. Stats will still be available In the “View Finished” area. Starting from the top of the drop-down menu in the upper-left corner, tap on Leagues. The First page will take you to a list of Leagues where you are active as a host or player. The Leagues are fueled by gold. All tournaments costs gold to enter plus any chips that the host requires. All Ring games cost gold per hand if they are eligible for the Bad Beat Jackpot or not. Bad Beat Jackpots inside of a League are only for players that are members of the League. The BBJs are fueled by the chips assigned by the host. The chips inside of a League are separate from the Play Chips available in the Public Lobby. Leagues have a few features not available in Private Rooms. Leagues have ranked ring games and ranked tournaments. The ring game rankings are based on profit. The tournament rankings are based on a Championship Point System. Multiple tournaments are played during a season. Points are up for grabs in every ranked tourney. Leagues also have the option of building a “League Pot”. A portion of chips from every tournament during the season can be thrown into the “League Pot” and paid out to players at the end of the season. Hosts can designate how many chips from each tournament are paid to the league pot and how many chips are paid to the players at the end of the tourney. Leagues have all of the features of a Private Room, but cannot be extended. A new league can be started again, but the stats reset. When the host renews a league after a league has finished, an invite will go out to all players in the League. Access to completed leagues will still be available in the “View Finished” area. From here you can create your own League where you can control who can enter and who gets chips and how many. You can create Custom Ring games and Tournaments. You can create a Bad Beat Jackpot for your Ring Games. You can choose if your games are ranked or not. Step 1: Enter League Name. Step 2: Set Prize schedule for League Payout. Tap the “Helper Tool” button. Next, enter the number of players that you want to receive a payout from the League at the end of the season. Tap the “Next” button. Then, use the slider tool on the next page to fine tune the payout percentages. Tap submit when you are finished. You will now see the updated payout info below the “Helper Tool” button. A payout written as 50, 30, 20 (in app) means 1st place gets 50% of the prize pool. 2nd place gets 30% and 3rd place gets 20%. This pot pays out at the end of the League. The League can be ended by the host or because time has expired. Step 3: Choose Rake or No Rake and the length of the League. There are 2 types of Leagues. Either the Host can rake or the Host cannot rake the games. Leagues without the rake feature are the cheapest option. Leagues with the rake feature have a detailed rake breakdown for each game type. This is found in the Host Tab. Choosing different League time lengths and rake on/off will change the gold prices in the window below (in app). League Length: The duration of the League. This time cannot be extended. A new league can be started and an invite will be sent to all league members. This will start a new season. Past seasons will be available in the “View Finished” area. Join League: This is the cost for another player to join your League. Cost To Create League: This is the cost that the Host pays to create the League. This is a feature where the host can make the players that join his League pay more gold per game and the extra gold goes into the Host’s account. Example: You want to create a League for your friends without a rake, but you want to create a reward for yourself for organizing the games. If you enter 50% in the Host Tax field, this means that all ring games will cost 50% more gold per hand. Also, all Tournaments will cost 50% more gold to enter. This extra gold goes directly into the Host’s account. This feature does not effect the rake and can also be used with raked ring games. Gold fuels the Leagues and “The Host Tax” makes the cost of the Leagues more expensive to the benefit of the Host. Step 5: After you have picked the appropriate options, tap the “Create” button. You will find invites to Leagues here. There is also a button for your invite code. Tap the “My Invite Code” button to give your invite code to a host. Copy and paste the code into your designated messaging app and send to the host. You cannot be invited to a League without providing your invite code. When Hosting, after a player has joined your League, they will show up in your recent invite list to invite them to another League without using the invite code. Here, you will find statistics from past Leagues in which you were a participant as either a Player or Host. Only Leagues that have expired appear here. If you run out of time while playing in a game, do not worry, your chips will still be accounted for in this section. Displays League Pot. Only applies to ranked tournaments. Paid when league has completed. Displays the Bad Beat Jackpot, if there is one. Displays the amount of time remaining in the League. Displays the amount of players in the League. Prize Schedule: Displays the payout schedule for the League. This will be paid out when they League is over. The League ends when time runs out or the host chooses to end the League. League Rankings: Displays the points standing for the League. Points can be awarded manually by the host here. Points are won in ranked tournaments. The Prize Schedule is based on these rankings. Ring Game Rankings: The rankings for League ring games are found here. Rankings are based on profit, not chip totals. Only ranked ring games affect the ranking displayed here. The host can create ranked and unranked ring games within the League. Previous Seasons: Leagues can be renewed (in Host Tab) and the results of past seasons can be found here. Displays the ring games for a League. A blue ribbon indicates that the Ring game is ranked. This icon will be on the far left of the table listing. This is where a host can add a custom ring game to their League. Step 12: Choose if ring game is ranked. The rankings appear on the Main tab of the League. Step 13: Add ring game. The games created here will show up in the “Tables” tab. Sit-and-Go Tournaments will be listed here. A blue ribbon to the far left of the listing indicates a ranked tourney. A listing of 100 + 25 + 10 Chips + 100 Gold = Buy-in + League Pot contribution + Fee (rake) + Gold fees. The Fee or Rake is only available in Leagues where the host has rake permission. Gold is required to play in all tournaments in Leagues and Private Rooms. Step 12a: League Settings. Enter an amount that goes into the League Pot (optional). The League Pot will be paid out at the end of the season. This amount is paid by the players in addition to the buy-in amount. The chips from the buy-in amount will be paid at the end of the tournament. Example: If the buy-in is 15 chips and the league pot contribution is 5 chips and the fee (only in rake enabled leagues) is 5 chips, the total to enter the tournament will be 25 chips plus the gold fees. If there are 10 players in this tournament, 150 chips will go to the prize pool, 50 chips go to the League Pot, and 50 chips will be collected by the host for a rake or tournament fee. Step 12b: League Settings continued… Choose if the tournament is ranked. If this option is enabled, points are awarded to the players based on placement in the tournament. A knockout bonus can also be chosen. This will award players extra points for knocking out other players. Step 12c: League Settings continued…Choose how many points are awarded based on placement. You can use the Auto Fill feature here. If there are 5 players in the tournament, this will automatically give 1st place 5 points, 2nd place 4 points, 3rd place 3 points, 4th place 2 points, and 5th place 1 point. Step 13: Add SNG. Your created SNG tournament will appear in the SNG tab. Tournaments with a scheduled time will be listed here. A blue ribbon to the far left of the listing indicates a ranked tourney. Step 3: Choose Buy-in amount and Fee amount (optional). The buy-in goes into the Prize Pool. The Fee goes to the host and is considered a rake for the tournament. Fee is only available in Leagues that have the rake feature. Step 15a: League Settings. Enter an amount that goes into the League Pot (optional). The League Pot will be paid out at the end of the season. This amount is paid by the players in addition to the buy-in amount. The chips from the buy-in amount will be paid at the end of the tournament. Example: If the buy-in is 15 chips and the league pot contribution is 5 chips and the fee (only in rake enabled leagues) is 5 chips, the total to enter the tournament will be 25 chips plus the gold fees. If there are 10 players in this tournament, 150 chips will go to the prize pool, 50 chips go to the League Pot, and 50 chips will be collected by the host for a rake or tournament fee. Step 15b: League Settings continued… Choose if the tournament is ranked. If this option is enabled, points are awarded to the players based on placement in the tournament. A knockout bonus can also be chosen. This will award players extra points for knocking out other players. Step 15c: League Settings continued…Choose how many points are awarded based on placement. You can use the Auto Fill feature here. If there are 5 players in the tournament, this will automatically give 1st place 5 points, 2nd place 4 points, 3rd place 3 points, 4th place 2 points, and 5th place 1 point. Step 16: Add MTT. Your created MTT tournament will appear in the MTT tab. This tab will only be available if you are the Host of the League. Invites from Search: When players search for your League, the invite requests will appear here. Invite: Once a player has shared their invite code with you, you can paste it into the text field and invite them. Once they accept the invite, they will be a part of your League. Example: Host sets BBJ to AhAsAc2s2h (suit does not matter). The community cards are AdAcAh3s8c. Player 1 has TdTs (pocket tens) for hole cards. Players 2 has 9s9d (pocket nines) for hole cards. If both players make it to a showdown on the river, the BBJ will be triggered. Player 1 would be the winner of the hand. Player 2 would be the loser of the hand. And the table share will be split between the remaining players. If there are only 2 players, the table share will be split by the 2 players. This button will create a new league when the current league ends. Once the League ends, invites will go out to all members of league. The league will now be joined to see past results. Leagues that have ended will always be available to view in the “View Finished” area. Ends the League even if there is still time remaining. All players will no longer be able to play inside the League. If the league was renewed, invites will go out to all members of the league. Stats will still be available In the “View Finished” area.